Bonnie Watson Coleman, a long-time and influential advocate for the people of New Jersey, is currently serving her sophomore term in the United States Congress. Prior to her election as Representative for New Jersey's 12th Congressional District, Watson Coleman served eight consecutive terms in the New Jersey General Assembly. Watson Coleman has led the call for reforms to prisoner re-entry programs, fighting tirelessly to shut the revolving door of recidivism for individuals who have returned from incarceration. During her time as Majority Leader, Watson Coleman convened a year-long series of public hearings on the topic while shepherding legislation through the New Jersey Assembly that The New York Times called "a model for the rest of the nation," on prisoner rehabilitation and release. 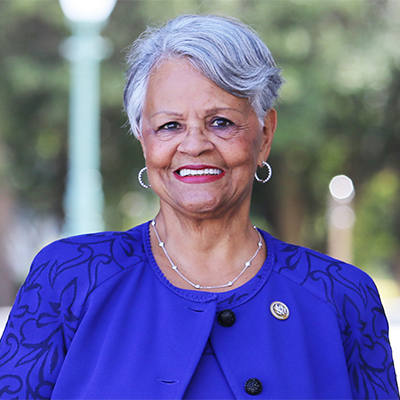 For her second term, as a member of the 115th Congress, Watson Coleman was selected by her colleagues as the Vice Ranking Member of the House Homeland Security Committee, where she is also Ranking Member on both the Subcommittee on Transportation and Protective Security. She also serves on the House Committee on Oversight and Government Reform. In 2016, Watson Coleman, alongside two of her colleagues, founded the Congressional Caucus on Black Women and Girls, the first House caucus to study policy issues related to the continued success and accomplishments of that population. Watson Coleman is an active member of the Congressional Black Caucus, the Congressional Progressive Caucus, the Congressional Caucus for Women's Issues, the Congressional LGBT Equality Caucus, and the Congressional Asian Pacific American Caucus. New Jersey has experienced one woman Governor in its history, and currently celebrates our fourth female member of Congress since 1925. How do we explain such a dismal performance when it comes to women in government in this highly evolved, educated state? What are the roadblocks, and how do we go around them? Two triumphant women share their stories in this moderated conversation.